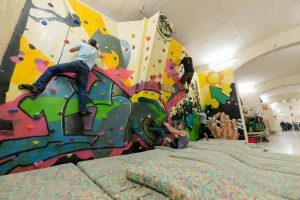 Back in 2003 having a climbing wall inside our headquarters was just the dream of a couple Unit members, but now seven years on, after a hefty amount of fund-raising, a lot of patience and perseverance it’s finally a reality! Actual work on the wall began in the summer of 2009, with the purchasing of all the materials that would go into the actual wall. After the completion of the actual structure the Unit went about getting the wall ready for its own personalised paint job with a couple of coats of white undercoat – then came in Matt and Pablo, a couple of graffiti artists who happened to be friends of the Unit leaders who offered their time and skills to give the wall the aesthetic value it deserved. Together with the ideas and guidance of several leaders, they started the process of designing the colour scheme and design of the wall – something which judging from the final result didn’t just happen overnight! After agreeing on the design, Matt and Pablo went about the tedious task of spraying and painting the wall by hand using only a projected image to guide them. They managed to complete the job in about five or six sessions after which members of the Unit began to varnish the wall to protect the paint from getting worn away. Unfortunately, as the wall neared completion, problems obtaining the holds for the wall stretched out the project longer than expected. After months of waiting, lengthy discussions, and phone calls the decision was taken to purchase the holds from another supplier – a cost which was unfortunately not budgeted for. However with the holds in the hand, the Group pushed on and with the help of the newly formed Malta Climbing Club, started planning and setting the several routes on the wall – with this done the leaders in the Group immediately started organising training sessions under the guidance of VSL Anthony and ASL Andrew, sometimes as frequent as three times a week to get accustomed to the wall and to gain the proper experience and training to be able to organise activities on the wall and to use it in a safe and controlled environment. At the moment talks are also underway with the Malta Climbing Club so that the wall will be open for use by their members and with other outside bodies, though nothing is set in stone yet. Now that the wall is up and running the Group is looking into ways how to utilise the wall as a fund-raising tool to fund the Group’s many ongoing projects, though at the moment everyone’s focus is on getting the leaders of the Group experienced and trained well enough so that they could, in turn, take the members themselves out to enjoy and learn from the sport of climbing.